The optical construction consists of a total of 19 elements in 14 groups, with three aspherical elements and a further four elements made from low dispersion glass to minimize chromatic aberrations, field curvature and distortion. Although the Sigma has the same 45cm (17.7-inch) minimum focus distance as the Canon it is slightly larger with a 82mm filter thread and weighs around 30 percent more at 885g (31.2 oz). Compatibility with the firm’s new optional USB dock offers user adjustments and firmware upgrades, adding further value to the already sensitively priced $899 ticket. 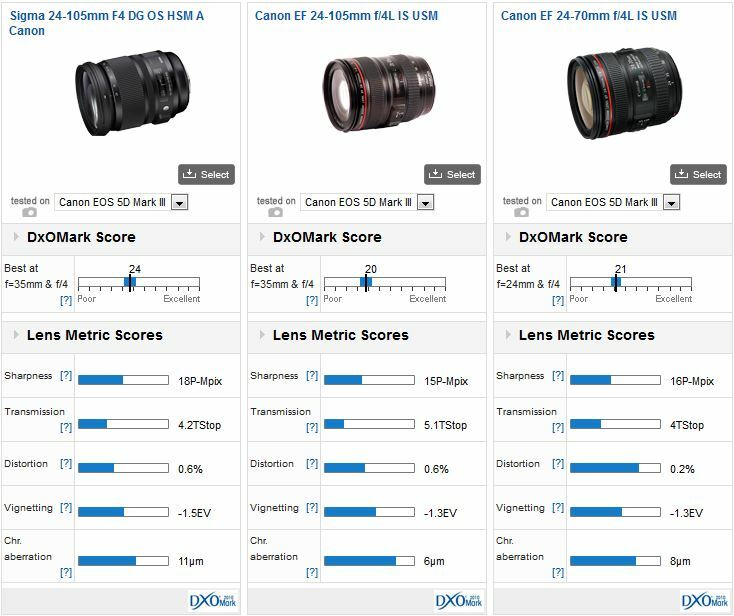 The new Sigma achieves a DxOMark lens score of 24 points on the 22-Mpix Canon EOS 5D Mk III, and has a very high sharpness score of 18P-Mpix, one of the sharpest in the professional zoom category. Sharpness is good in center but corner sharpness is noticeably lower throughout the zoom range and aperture settings. 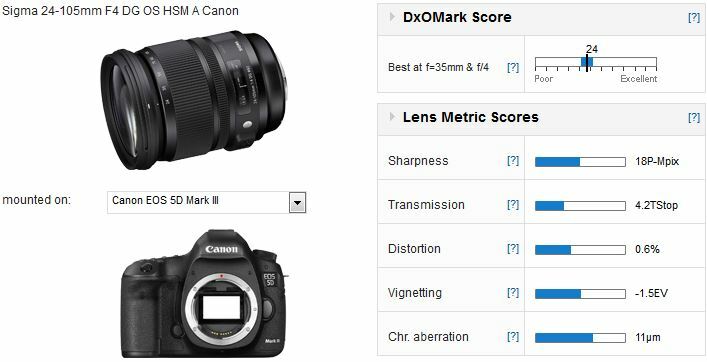 Nevertheless the overall performance puts it in joint third place in our rankings for those lenses, just ahead of Canon’s previous EF 24-70mm f2.8L USM and Sigma’s current 24-70mm f2.8 model. More importantly perhaps, it’s also ahead of the Canon 24-105mm f4L IS USM, which is ranked seventh and the EF24-70 f4L IS USM ranked sixth. However, at maximum aperture, vignetting is quite strong between the 70 to 105mm focal lengths and chromatic aberration, while low for this type of lens, may be visible at either ends of the zoom range. Barrel distortion is slightly higher than average and it quickly turns to pincushion at 35mm. 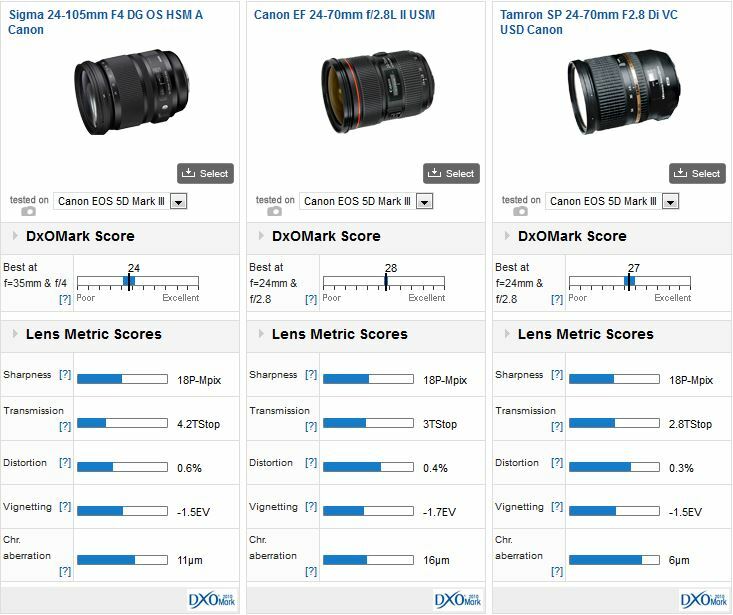 When compared against the Canon 24-105mm f4L, to be fair an aging model now, the Sigma outperforms it in several key areas. It has higher peak sharpness at every focal length and at the initial aperture it has better corner sharpness at the longer end of the zoom, which is a limitation of the Canon equivalent. Another benefit is the just over +1/2 stop improvement in Transmission. But while distortion is similar the Canon has a slight better control of vignetting and slightly lower lateral chromatic aberration. Compared to the 24-70mm f4, the Sigma exhibits the same characteristics as it did with the 24-105mm, notably that it’s sharper and more uniform across the frame throughout the range at the wider apertures. In all other respects the 24-70mm has a slight advantage. It has less distortion, lower vignetting and better control of CA, though at 24mm it’s noticeable in the extreme corners at every aperture. We were curious to see how the Sigma panned out against the new Canon EF 24-70mm f2.8 II USM and the newer stabilized Tamron equivalent, both state-of-the-art models. Surprisingly, the Sigma can match both in peak sharpness but not quite in terms of uniformity. Although only slightly lower, the Sigma’s peripheral sharpness isn’t quite a match for either model at f4 to f8 throughout the zoom range. 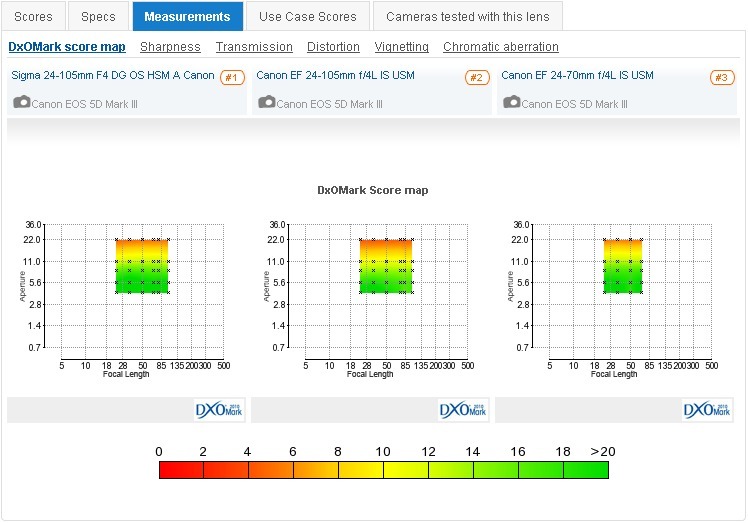 The Sigma also has higher barrel distortion than the Canon at 24mm and has more noticeable pincushion than either model, which develops quite early on in the zoom range and is evident at 35mm. On the plus side the challenger has better control of CA than the Canon at all focal lengths and it’s lower than the Tamron in the corners at its widest focal length (where it’s quite noticeable with that model). 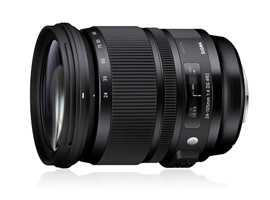 Given its popularity, Canon has been slow to replace the EF24-105mm f4L IS USM, and it has provided rival Sigma with the opportunity to gain some leverage in this highly competitive sector. Sigma are sure to be rewarded as it’s not only a superb performer optically, at $899 it comfortably undercuts the Canon and is well worth taking a closer look.